Surprise Surprise | Arts and Culture | Style Weekly - Richmond, VA local news, arts, and events. Local trumpeter Rex Richardson plays Radiohead. After coming to town as an assistant professor at VCU, teaching and building the brass chamber-music program, it was natural for him to link up with a local scene rich in student and graduate players. For the past two years he's played freewheeling, riff-based big-band jazz with the Devil's Workshop, and appeared on the most recent CD's of the Oregon Hill Funk All Stars and the Modern Groove Syndicate. He's recently started his own band, X-Ray Rextet. "'Rextet' lets me change the number of players in the band without changing the name," Richardson explains, "'and X-Ray is my name in pig Latin." Whatever the setting, he plays adventurous music  creating uncertainty is an essential part of his collaborations. "I like rhythm players that help you compose a solo," Richardson says, "and sabotage is better than being overcareful. I like a drummer who rolls logs at your feet, forcing you to dance or be wiped out." The trick is to apply the same creative principle to classical music. "Even a warhorse like the Haydn trumpet concerto, if you play it like you are improvising, can come to life." Richardson compares the process to the theater, actors delivering someone else's words with energy, conviction and naturalness. A champion of modern classical music, Richardson has an upcoming recital in Greece dedicated to bracingly new compositions, requiring acrobatic skills on the trumpet and potentially leaving the audience behind. "I love stuff that forces me to deal with new concepts musically and new challenges physically," he says, "but it may be exhausting for everyone else." While he recognizes the difficulties for the average listener, he is often frustrated by the conservatism of fellow performers. "They dismiss anything that is too challenging, that they don't know how to approach on their instrument. Even some music that is over 100 years old is still too new." Expanding the soundscape is a musician's responsibility. "If all you had ever heard was Beethoven," Richardson says. "What would you do when you first heard Radiohead?" Mixing venerable compositions with jazz standards and popular music is the mission of Rhythm and Brass, the renowned horn quintet plus drums the trumpeter joined a decade ago. The band, which will perform at VCU on Sept. 29 and Oct. 1, is a mix of improvisers like Richardson and masterful classical interpreters. "We all understand what we do well," Richardson says. "We have a deep musical and personal respect, and we challenge each other all the time." The first concert will include soloists from the VCU wind ensemble and will feature "Io Rising," a commissioned piece by composer Dana Wilson as well as the group's arrangement of Juan Tizol's "Caravan." The Oct. 1 concert is likely to include the band's humorously idiosyncratic take on Pink Floyd's "Dark Side of the Moon." The organizing concept comes from the popular theory that the '70s classic makes an uncannily apt soundtrack to the first 40 minutes of the 1939 film "The Wizard of Oz." What matters most to Richardson and his colleagues is not the pedigree of a piece of music, but its ability to support the magical unpredictability of creativity. "What makes music exciting," Richardson insists, "is not the sonority, but the surprise." 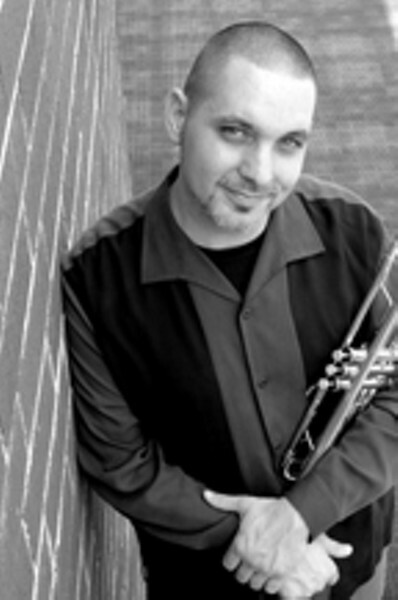 Rex Richardson will be performing a faculty recital on Sept. 22 and again with Rhythm and Brass on Sept. 29 and Oct. 1. All shows are free, at VCU's Singleton Performing Arts Center, 8 p.m.